An Epson SureColor P600 printer was purchased a little over a year ago (April, 2015) with the help of donations from the Aardenburg Imaging & Archives membership. The SC P600 is the first Epson printer model on the market to use the newly formulated Epson UltraChrome HD ink set. This study compares the lightfastness performance of the new UltraChrome HD ink set to Epson’s older and widely used UltraChrome K3 ink set. Two high-quality cotton base and OBA-free fine art media, one a fine art matte paper the other a fine art “traditional fiber” paper with a luster finish, were chosen for the study. By choosing completely OBA-free media, there is no influence of fade-prone optical brightening agents on the outcome of the test scores. One of the media, Hahnemühle Photo Rag Pearl, has previously demonstrated excellent compatibility with all of the major OEM pigmented ink sets and is a personal favorite of mine. The other paper, Epson Exhibition Watercolor Paper Textured (not to be confused with Epson’s high-OBA content “Exhibition Fiber” paper) is new to the Aardenburg Archives materials collection, but it is expected to perform like other highly rated OBA-free fine art matte media we have tested. Our study has been experimentally designed with a direct side-by-side testing environment where all samples are being exposed under identical light, temperature, and humidity conditions on the same light fade test unit. Aardenburg’s 30 patch standard color target was printed with the SC P600, an Epson 3880 printer which uses the UltraChrome K3 ink set, and a Canon iPF8300 which uses the Canon Lucia EX ink set. When the new inks and printer models were introduced last year, Epson’s contracted print permanence testing with Wilhelm Imaging Research, Inc. (WIR) was still in progress, and as of May, 2016 the final results still appear to be unpublished. 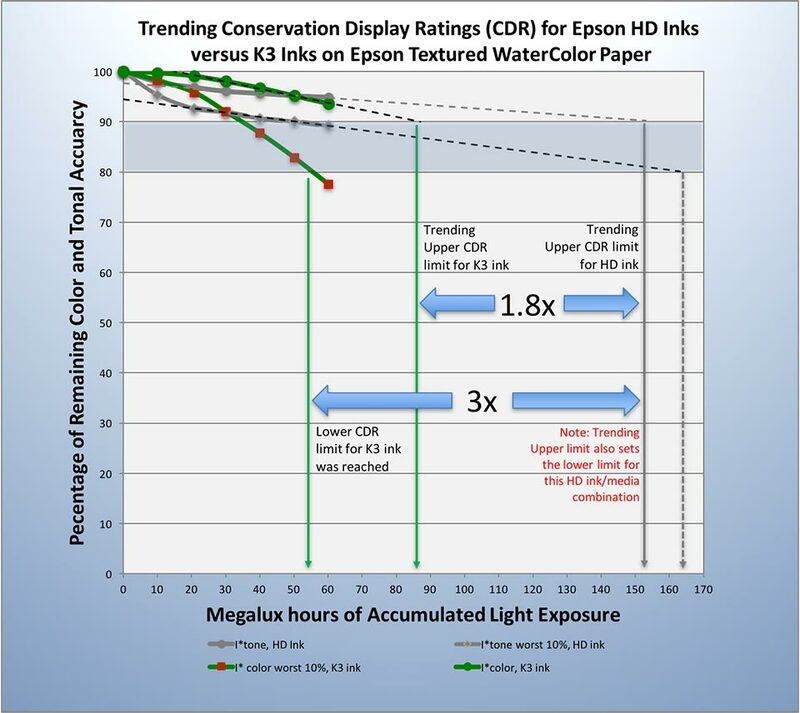 In lieu of the actual completed test results, Epson’s marketing team issued a Press Release with preliminary findings that forecast a 2x light fastness improvement and 200+ years of color print display life on select media once the testing is finally complete. The 200 year claim is based on an assumption of 450 Lux average light intensity for 12 hours per day. This assumption also equates to approximately 400 Megalux hours of total light exposure in testing to reach WIR’s densitometric endpoint criteria for easily noticeable fade at the predicted time of 200 years on display. Even on the most high-intensity commercial light fade testing equipment which can greatly accelerate the test cycle it still takes a lot of time to conduct such a test! Aardenburg Imaging’s light fade testing equipment is kept at much lower light intensity than most commercially available test units in order to better avoid sample desiccation and potential light intensity reciprocity failure effects during the exposure cycle. A 400 Megalux hour exposure dose on our light fade testing equipment would take several years in test. However, the Aardenburg Conservation Display ratings are based on stricter visual limits for allowable fade compared to the WIR display life ratings. Because we are interested from a fine art quality perspective in the early stages of little or no noticeable fading rather than more extensive fading allowed in many consumer-oriented fade tests, we won’t need 400 Megalux hours to reach the respective Aardenburg Conservation Display ratings for the samples now in test. We also use the more advanced I* metric rather than multiple densitometric endpoint criteria to calculate visually perceptible losses in color and tonal accuracy at every step along the exposure curve as print fading progresses. Thus, our study of the HD and K3 ink sets will likely require less than half the exposure dose (i.e., 200 megalux hours) to complete the Conservation Display ratings for the three printer/ink/media combinations we now have in test. That said, the 60 Megalux hours of exposure data already completed in this ongoing study now allows us to report some preliminary findings using similar analytical methods Epson relied upon to release its preliminary claims. A statistical trend line analysis can be used to forecast whether our testing is currently on track to validate Epson’s 2x improved light fastness claim. If the Aardenburg testing protocol and Conservation Display Ratings are new to you and you’d like to know more about them, we encourage you to read a few of the supporting documents which you can find here. After an initial 20 Megalux hours of exposure, both the HD and K3 ink sets settled into linear fading curves for both color and tonal accuracy. These curves can be fitted nicely with a linear trend line, i.e., a straight line with a very high degree of fit to the five data points of I* tone and I* color scores collected at the 20, 30, 40, 50, and 60 Megalux hour exposure intervals. The straight line relationships can then be extrapolated to higher exposure doses and corresponding I* values that forecast what the final Conservation Display ratings will likely be once the testing is complete. 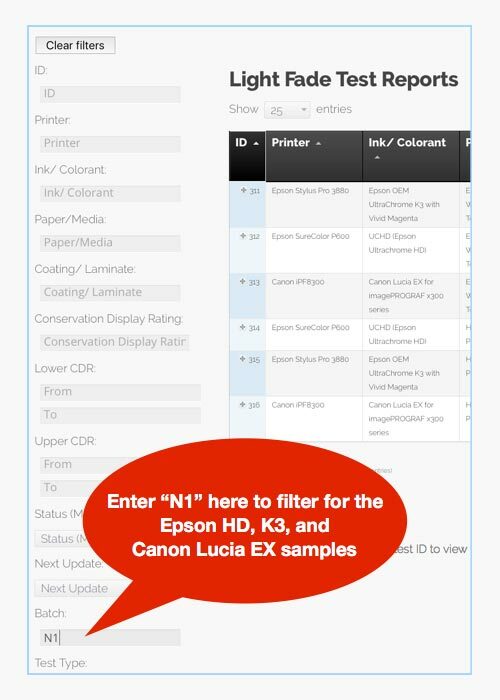 The formal test reports for the HD ink set and K3 ink sets printed on both Epson WaterColor Textured paper and Hahnemühle Photo Rag Pearl paper can all be located in the Aardenburg light fade database easily by filtering the database on “Batch = N1”. We will continue to update these reports on regular intervals until we reach the 200 Megalux hour exposure interval. Each report contains the data for both the average I* color and I* tone scores overall and also the I* color and I* tone scores for the worst performing 10% of the patches (i.e, the averaged values of the 3 most changed patches in the 30 patch target). As noted above, with 60 Megalux hours completed in test we can now forecast with reasonable confidence which curves, I* tone or I* color, will likely trigger the final Conservation Display rating limits. For the K3 ink set, the I* color curves will trigger both the lower and upper display rating limits. In fact, the lower limit for the K3 samples has already been reached. The K3 color fading “signature” is consistent with many previously conducted Aardenburg light fade tests of K3 inks on numerous media. With respect to light fading, the K3 ink set causes significant image color shifts due to the premature fading of the yellow ink. The more rapid loss of yellow affects any color blends that rely on the yellow ink to achieve proper hue and chroma, for example, the light skin tones. The HD ink set exhibits a greatly improved yellow performance which in turn reduces the tendency to color shift as the fading progresses. The HD ink thus displays a much more “balanced fade” behavior. This is a good thing! All inks fade on display eventually, some much faster than others, but color balanced fading is the hallmark of optimally designed ink sets when it comes to making truly long lasting prints. 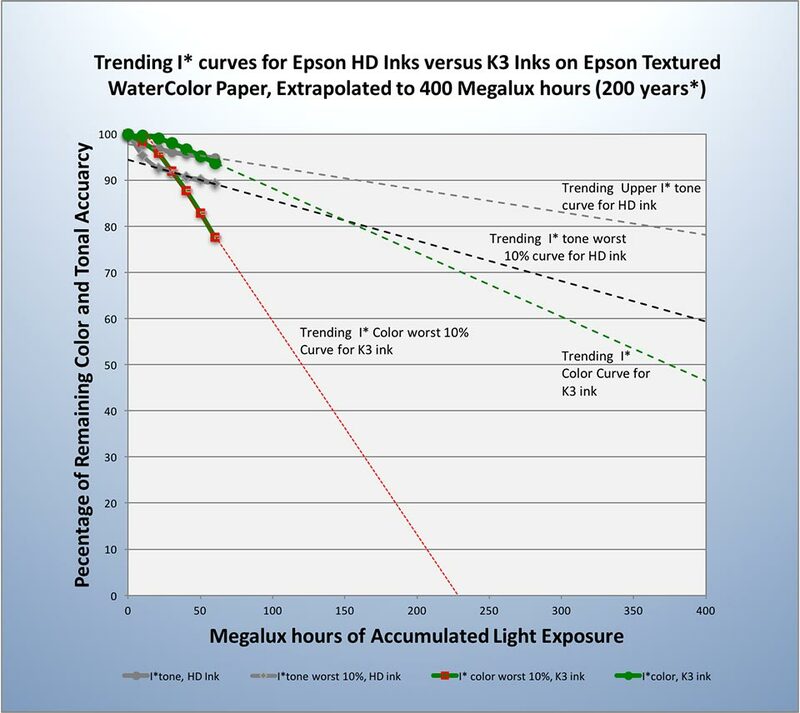 The Epson WaterColor Paper Textured (EWPT) media curves (plotted in the graph above) show that the HD ink set is forecast to reach a Conservation Display rating of approximately 155-155 Megalux hours based on I* tone performance rather than I* color. The fact that the worst 10% of the 30 target patches are not deviating very much from the average performance of all patches and that I* color is not forecast to reach a limit earlier than the I* tone curve means this outcome is indicative of a very well “balanced fade” ink and media combination. 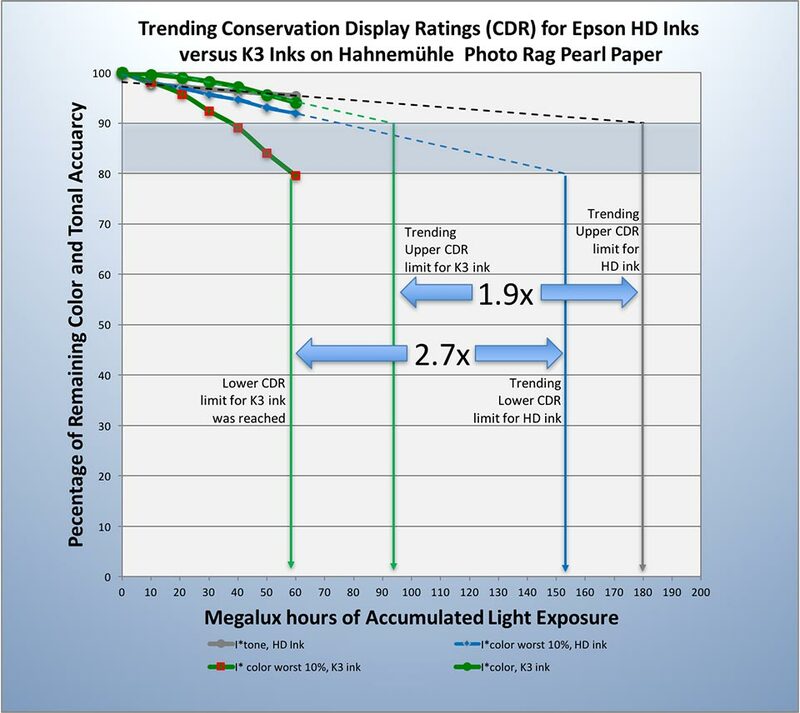 The HN Photo Rag Pearl (HPRP) result slightly outperforms the EWPT media with a forecast Conservation Display rating (CDR) of approximately 155-180 Megalux hours despite exhibiting slightly more color imbalance at the CDR endpoints compared to the EWPT paper. It triggers the lower CDR limit first on the I*color worst 10% curve, whereas the upper limit is predicted to trigger on I* tone. Nevertheless, the 155-180 Megalux hour CDR forecast indicates this HD and HPRP ink/media combination will tolerate much more light exposure while retaining significantly better color balance over time compared to the 59-93 Megalux hour estimate for the older K3 ink set on the very same paper. It’s fair to say that Epson’s “HD is 2x better than K3” claim holds up well with both media tested in this study. Average overall fading performance (i.e., the upper CDR limits) exhibit a 1.8x and 1.9x improvement factor for the EWPT and HPRP media respectively which is just a little shy of a 2x overall improvement. However, the worst performing 10% of patches in each test sample demonstrate a respective 3x and 2.7x improvement. For pictorial images that contain these colors, this is an impressive benefit, and it again speaks to the superior “balanced fading” behavior of the HD ink set. Hence, Epson’s 2x claim is actually somewhat conservative for any prints that contain some of those faster fading color blends. Given that important skin tone colors are among the faster fading colors when printed with the the K3 inks, a 3-fold improvement in their light fade resistance should be viewed as a big deal for portrait photography. Epson’s R&D team is to be highly commended for achieving this significant improvement in its newest HD ink set. Expressing light fastness ratings in terms of “years on display” by assuming a “one-light-level-fits-all” figure of merit is an unfortunate oversimplification of print longevity. Sadly, this methodology has become entrenched in the industry. Many consumers mistakenly believe these “years on display” predictions are absolute and that print owners have little or no control over the outcome when in fact they have a huge say in the matter. Illumination levels for prints on display in real world indoor environments vary by orders of magnitude. The print owner can exert much control on the lighting parameters, and thus the actual “display life” of any print is highly pliable in real world settings. A more defensible lightfastness rating is accomplished merely by expressing the score on a calibrated exposure scale (e.g., Megalux hours) and then refraining from any further error-prone assumptions on environmental conditions in the display location. Knowledge of specific illumination levels are best left to the print owner, curator, or collector who in turn can easily make a more informed estimate of expected display life. Epson’s 200 year display life prediction is also based on an “easily noticeable” fade criterion calculated by a multi-criteria densitometric model that will apparently reach compliance at equal to or greater than 400 Megalux hours in test. It is not possible to translate densitometric measurements into perceptually linear fading curves, but I* color and tone curves are perceptually linear. We can examine trend line forecasting at the 400 Megalux hour mark to see how much of the I* color and tonal accuracy may remain at this exposure dose required to satisfy the Epson 200 year light fastness claim. The graph below extrapolates our 60 Megalux hour scores to 400 Megalux hour scores under the assumption that the actual fading rates will also continue to be linear. This continuing linearity assumption is admittedly a stretch over such an extended exposure scale because many pigmented inks exhibit non linear fading behavior. Fade rates can speed up before also eventually slowing down as extreme levels of fading are reached. Bearing this caveat in mind, the trend line projections shown in the graph below forecast that overall tonal accuracy for the HD ink will decline to 75-80% (i.e., satisfactory) retention of original image quality with the worst 10% of the patches’ tone relationships to their nearest neighbors dropping to 60% tonal accuracy (poor). The faded image will still have functional information content, but its overall tonality will be noticeably compromised by the fading. Color accuracy should be better or equal to the tonal accuracy scores as well. In comparison, a print made with the K3 ink set will fail dramatically on color balance with overall color accuracy reaching less than 50% at 400 Megalux hours and the worst 10% of the colors actually going into a “false color” reproduction state at under 250 Megalux hours of accumulated exposure. Negative I* color values mean false colors now appear in the image. Hue and chroma will be so far away in certain colors from their original printed values that the viewer will be interpreting some color content information erroneously. Epson’s 400 Megalux hours = 200 years assumption also begs the question “Don’t museum curators and serious collectors have a better option for preserving prints and photographs than simply accepting consumer-oriented display life ratings as inevitable?” Yes, of course they do. A key to preserving prints on display for long periods of time is to reject the 450 Lux proposition for average light levels on display and to also demand tougher standards in the allowed tolerances for fading on display. The Aardenburg Conservation Display limits rate the HD ink on both media at 150+ Megalux hours of allowable light exposure, and the rating also factors in tougher limits for acceptable fading such that the prints will remain in very good to excellent condition over the allotted Megalux hours of exposure…i.e., what a museum curator or print collector wants. Lastly, let’s consider how the print owner might use the Aardenburg Conservation Display ratings to estimate “display life” in a specific indoor location and also tailor the lighting levels to extend the life of the print on display. The well known “Reciprocity law” states that Exposure = intensity x time. Every photographer relies on this reciprocity law when adjusting camera f stops and shutter speeds, but it works for prints on display in exactly the same way. Hence, as we lower the light intensity on the print, the display time can be increased proportionally to maintain the same exposure dose. The Aardenburg Conservation Display rating forecast in this ongoing study is currently 150+ Megalux hours. This exposure value thus yields a display life prediction of 150+ years when illumination levels are assumed to be 228 lux for 12 hours per day or less. Epson’s assumption of 450 Lux is approximately twice the intensity level of 228 Lux, and according to the reciprocity law, the calculated display time is now cut in half (i.e 75 years). 75 years on continuous display is significantly less than Epson’s reported 200 year claim, but again, bear in mind that the Aardenburg CDR also accepts a much less noticeable amount of fading at the rated endpoint in test. As a further example of this reciprocity relationship, consider what happens when the illumination on the print is halved rather than doubled (i.e., 114 Lux average daily illumination). For a CDR value of 150 Megalux hours, the reciprocity law then predicts continuous daily display with very good to excellent color and tone retention for 300 years or more! Eastman Kodak once estimated 90% of all prints on indoor home display experience no more than 120 Lux illumination for 12 hours per day. Thus, average indoor illumination levels are likely to fall well below either 228 Lux or 450 Lux assumed values for the majority of prints in typical home display environments. Unfortunately, It’s those 10% of prints on display not included in Kodak’s 90 percentile under 120 Lux figure where light faded prints are typically observed in a home environment. Those outliers can be subject to average illumination levels well in excess of 1000 Lux and it is in these display locations where real world fading starts to surprise consumers who take the manufacturers’ light fastness claims for granted. In contrast, museums often enforce 50 Lux illumination levels for artwork on display and typically do not keep valuable prints and photographs on continuous display. In summary, under prudent real world home display conditions and more so in museums where care is taken to observe even safer UV excluded illumination levels, light fading issues will probably not be the weak link in print longevity for HD prints on high quality papers. Other factors like physical handling damage, heat and humidity, smoke and/or water damage, gas fading, and other air pollution effects will likely become the more determining factors for the condition of Epson HD prints in the decades and centuries to come. Epson’s claim of 200+ years of display life can indeed be achieved with HD inks when making color prints on high quality media but only when lower expectations for eventual color and tone fidelity are tolerated, or when illumination levels lower than 450 Lux combined with reduced hours of illumination are implemented by the print curators to help preserve good to excellent color and tonal fidelity over the desired 200 year time span. The Epson HD pigmented ink set offers a dramatic improvement in light fade resistance compared to the older Epson K3 pigmented inks. Epson’s “2x better” claim is also genuine, yet it actually understates how much better the new HD ink set really is in comparison to its predecessor K3 ink set. The color balanced fading behavior of the new HD set is a big deal. All color and tonal relationships in the image, especially important skin tone colors, will retain more of their original fidelity significantly longer. When the prints do start to exhibit noticeable fading as all color prints eventually will over time, lightness and contrast changes rather than severe color shifts will first become apparent, and this image fading “signature” is typically less objectionable to most viewers than is a serious shift in color balance accompanied by some loss in tonal fidelity as well. How long the prints will actually last is greatly dependent on many real world factors. Epson’s claim of 200 year print longevity must be tempered by an informed choice of real world environmental conditions. Donate to Aardenburg Imaging to help fund additional essential industry research for printmakers.